blogs t r e t c h: DCist Happy Hour! Yikes! It'd be nice if spelled my headlines correctly! Stupid mystery letter-inserting computer problem! This post is no longer about the DCist Happcy Hour. Come one come all! Come hang out with me and my fellow eJournalists at Cue Bar next Thursday. 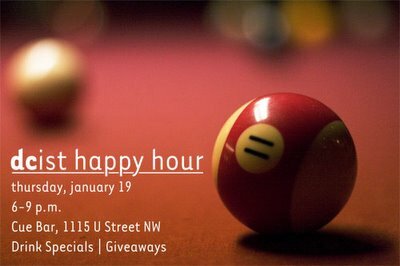 Play pool and darts and drink from the drink specials and enjoy the company of some generally cool people!